If you’re trying to sell your house, the first thing a Realtor will tell you is to break out the paint roller. 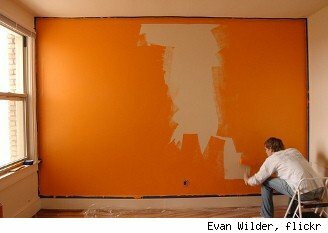 A fresh coat of paint is the quickest and least expensive way to lighten, brighten and perk up a home’s interior. It’s also a job you can tackle yourself–if you do it right. In today’s “DIY Diagnosis,” our friend Brie Dyas at DIYLife tells you how to paint a room for great results. The arrival of a new season always triggers a need to change up the wall colors in my home. And when I want a change, I want one now. But when it comes to painting a room, it’s easy to get swept up in getting the job done instead of getting the job done right. Here’s a handy list of common problems that can come up, why they did and how you can stop ’em. – A dark hue looks faded. This happens when you paint over a light color with darker one. To prevent this from happening, apply a gray-tinted primer coat in between. This will stop the lighter hue from bleeding through the bolder one, and will create a neutral base that’ll let bold hues look their best. – A random shiny spot appears a week after painting. When a flat paint is applied to a high-traffic area, a glossy spot can appear where hands (or a sponge) frequently comes in contact with the painted surface, rubbing off the matte finish. So, when it comes to high-traffic areas where you know you’ll have to do some cleaning, go for a semi-gloss. For the rest of the tips, read the full story at DIYLife.